Variscite Tumble Stone - Extra Grade, "Lucin"
Variscite Tumbled Stone Extra Grade "Lucin"
This superb high quality bright green Variscite comes from the Lucin Mine in Utah. This is only rarely available as the mine was shut down a few years ago. I was reading up on this and it turns out that instead of using accepted mining techniques, the guy who owned the mine would light a stick of dynamite outside the mine, run inside and throw it in as far as he could and then run out again before he got blown up or showered in Variscite ! Needles to say, the authorities closed down the mine for breaches of health and safety - and to keep the owner alive !! Nonetheless, the odd little pockets that are mined now produce this rare and excellent high grade stone. Variscite is an excellent stone for helping us see solutions to problems that have been bugging us for years. 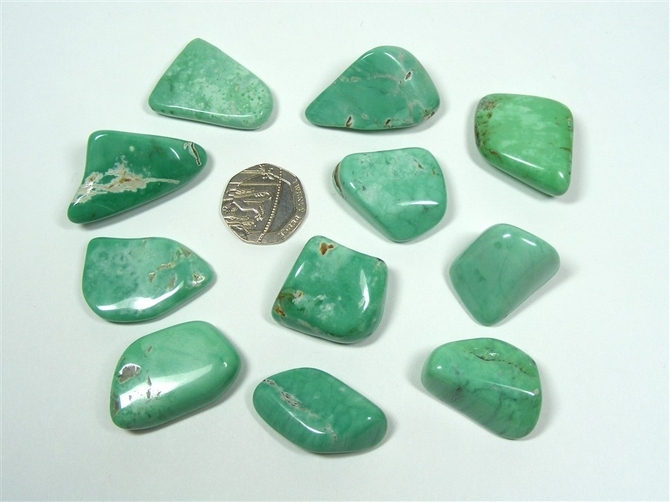 Variscite is said to help heal the nervous system. It is also believed to help with abdominal distension and those instances where blood flow is constricted. It may also help to restore elasticity to the veins and to the skin. Variscite may be beneficial in treating male impotence and disorders of the male reproductive system. It is thought by some to fight chronic tiredness and encourage us to be more fully awake. At night time, it is said to help calm our mind and ensure a peaceful sleep. Variscite is a stone of encouragement, particularly useful for when dealing with invalids or with illness, giving hope and courage (to both the carer and the person being looked after). It helps us to move from feelings of despair towards feelings of hope and trust in the universe. Variscite also brings us a sense of peace and calm and helps to stop us being so nervous. It aids concentration and helps us to see simple solutions to problems that may have been "bugging" us for years. 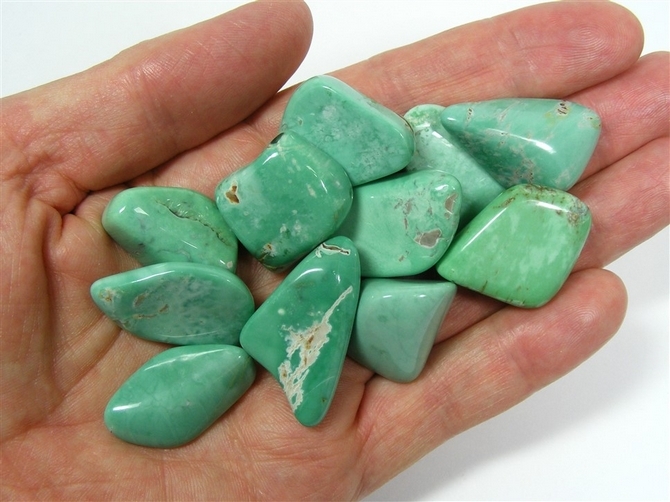 Variscite encourages us to be authentic and honest and removes pretentiousness. Variscite brings to us the joy of universal love. It also aids dream recall and is good for when we wish to stimulate past life memories.